Small spaces are no problem for this 20-inch electric freestanding range. The contemporary styling complements any kitchen design. Match your burner to the size of your pot with three, six-inch and one eight-inch coil elements. Plus, an oven light and large oven window make it easy to check on your food without opening the door. 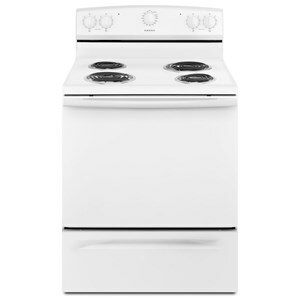 The Electric Range 20" Freestanding Electric Range with 2.6 Cu. Ft. Oven by Amana at Pedigo Furniture in the Livingston, Onalaska, Trinity, Coldspring, Corrigan, Huntsville, TX area. Product availability may vary. Contact us for the most current availability on this product. Total Oven Capacity 4.6 Cu. Ft. Create the perfect kitchen with one of these stellar electric ranges. With a number of finishes to choose from, such a delightful bisque, or a sleek stainless steel, you will be able to find the right range to match your kitchen décor. Bake your favorite kind of cookies and prepare your most popular dish using one of these magnificent ranges! 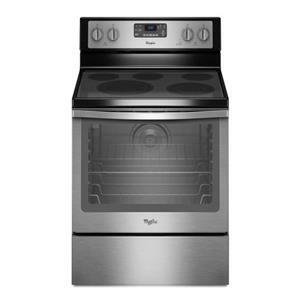 The Electric Range collection is a great option if you are looking for Appliances in the Livingston, Onalaska, Trinity, Coldspring, Corrigan, Huntsville, TX area. Browse other items in the Electric Range collection from Pedigo Furniture in the Livingston, Onalaska, Trinity, Coldspring, Corrigan, Huntsville, TX area.